It's 8.20am and Gus of the Web Detective Agency is first into the office. There he finds his boss, Vlad, head on his arms, asleep at his deck. Gus: Vlad. .. Vlad, what are you doing asleep? Have you been here all night? Gus: I said have you been here all night? Vlad: Gus, could you make me a cup of coffee. Gus: Sure. But tell me what you’ve been doing. Vlad: I got an email just before I was leaving from Brian Clifton wanting me to review parts of his new book. Gus: You got an email from The Grok ? O M G. I love his books, especially, what’s it called, Teaching Your Dog to Bark. Vlad: No, Clifton not Eisenberg, and it’s Your Cat, not Your Dog. Gus: Oh right. You mean Brian Clifton, the wrestler? Look, I don’t think I can’t take much more of this conversation. I am going to head home. Gus: Well, aren’t you going to show me the book review? Vlad: Here, you can read it yourself. In Brain Clifton’s second edition of his highly respected book, Clifton has much ground to make up since the first edition was published in April 2008, not least the explosion in social media, the dominance of a new generation of internet-ready mobile devices as well as Google Analytics’ range of new features and customizations. So, what's the book like? With only a couple of chapters, an introduction and a table of contents to go by, I’m wary of making criticisms that are addressed elsewhere in the book. Perhaps that’s why I have only been given two chapters (cynical, moi?). But let’s start with some facts. This book, unlike many Web analytics publications, is not tool agnostic. 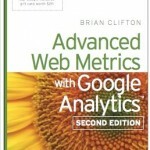 It is a book about how to *do* Web analytics with Google Analytics. To Clifton’s credit he does not come over as a GA evangelist or as a publicist of the tools of his former employer. There is an acceptance that Google Analytics sits within a range of tools that are required for web analytics proper – including voice-of-customer, usability testing and other qualitative tools. However, Clifton neatly sidesteps the tension between wishing to ‘join’ your web analytics data and your customer database and Google's no-messing policy on privacy and identifying website visitors using GA. The book has been sectioned in a very similar way to the first edition. This is evolution rather than revolution, and for owners of the first edition you will feel a need to gallop through some oft-repeated historical preambles – unless you get your kicks from reading about web sniffers and packet beacons, or is it the other way around ? Whatever.. But there has been a clear effort to cram more of the good stuff in. The first three sections in the Second Edition, covering the nuts and bolts of Google Analytics, have increased from 211 to 299 pages – an inflation-busting 41%. The last section – using Visitor Data to Drive Website Improvement, for me the real ‘meat’ of the book, has grown by 30%. The book now weighs in at just shy of 500 pages. What I liked throughout the sections I read was the real-life examples, in fact, some of them could have been expanded a bit further. Overall though, Clifton’s approach to rooting some of his explanations in the real world process of website optimisation will be beneficial to most readers. Likewise, the section on developing intermediate goals (white paper downloads, add to baskets, email newsletter subscriptions, etc) reminds us that to obsess purely about the website’s overall conversion rate is to miss the point – a transaction is made up of several mini-conversions. This is not a new point by any means but Clifton expresses the point well and again ties the concept back to real-world examples. The interplay between what you see in your website data (‘observations’) and what you could do about them (‘actions’) again serves the reader well, by explaining how important it is to always align insight with action. It is no easy task to talk about how to interpret numbers in prose, but emphasis on when to rely on percentages and when to bring in the raw numbers allows the casual reader to grasp some of the basics of data interpretation. More of this type of hints and tips would not have gone amiss – certainly in the sections I read. Finally, I have always liked the section on KPI’s by job role, showing what KPI’s a Webmaster should have versus a Marketing Manager versus an Ecommerce Manager. Clifton shows himself attuned to both the different sectors in which web analytics has to plough its furrow, as well as the different obsessions that different people will have in the organization. Again, not a new idea, but well expressed and succinctly phrased. Just like the sub-head above, Web analytics is awash with words and phrases that almost mean nothing. I would like to join people like Tim Ash in a campaign to rid Web analytics of bland, meaningless terms. When Tim opines “Your website is ugly, face it” I know exactly what he means. Unfortunately, if there is a bad strain of using vanilla words when good ol’ fashioned bare facts could be used, Clifton sometimes suffers quite badly. Words like “nonzero”, “aggregate level”, “nonhierarchical” and “normalized” only serve to drive a wedge between the reader and his/her grasp of the text. Add this to a hard layer of TLAs (three-letter acronyms) and the text sometimes becomes a bit Arctic – impervious to penetration. If the editor should take a voluntary paycut, the art director of this particular book should be on a ledge somewhere. Perhaps it’s just a preview copy, but the only colour appears on the front cover. There are some truly awful drawings – check out the drawing of a horizontal (!) funnel on page 331. But I don’t want to leave you with the notion that the choice of words and artwork are my only criticisms. I would have liked to have seen more about exploring how to divine what is different between the different ‘visitor types’ – PPC, natural, with transactions, with conversions, direct, etc. in the same way that marketers develop ‘pen profiles’. I think this approach, backed up with a few examples, could have brought to life the point that visitors are different in a number of ways, and this is one way to conceptualise these difference. Secondly, I would have liked to see more content dedicated to analysing social media. I felt myself not agreeing with Clifton when he asserted that KPI’s for Web 1.0 are the same as 2.0. I think there is a discussion to be had here about that statement. However, I do accept that a book that is predominantly a ‘how-to-use-a-tool’ book may not easily make this leap into a more esoteric discussion. Finally, looking at the table of contents, it would have been refreshing to have seen Clifton deal with some real-world queries and issues commonly raised by users of Google Analytics. This could have been usefully done in a Question-Answer format that Jim Novo successfully uses in his book ‘Drilling Down’. And would you buy it? Yes, I would, but I know I am going to skip a chunk of it, because I know the first edition so well. I am interested to see how Google Analytics can continue to be extended both by new features, hacks and API calls, but I am also interested in the brief examples through which Clifton brings the analysis of website data to life. Gus: Vlad? Vlad? Are you still here?